In a 'Video Wall' configuration, Zoom Presenter is used to render Video, Image and Interactive content across multiple display devices transforming the display devices into a single, larger display. A video wall configuration is comprised of at least two display devices connected to a Windows PC. The only limit to the number of display devices comprising a video wall is the capability of the display card(s) hardware. For example, high-end AMD/NVIDIA display cards can easily support a video wall configuration comprised of 4 display devices. Setup of the video wall layout is carried out through Window's "Screen Resolution" dialog. 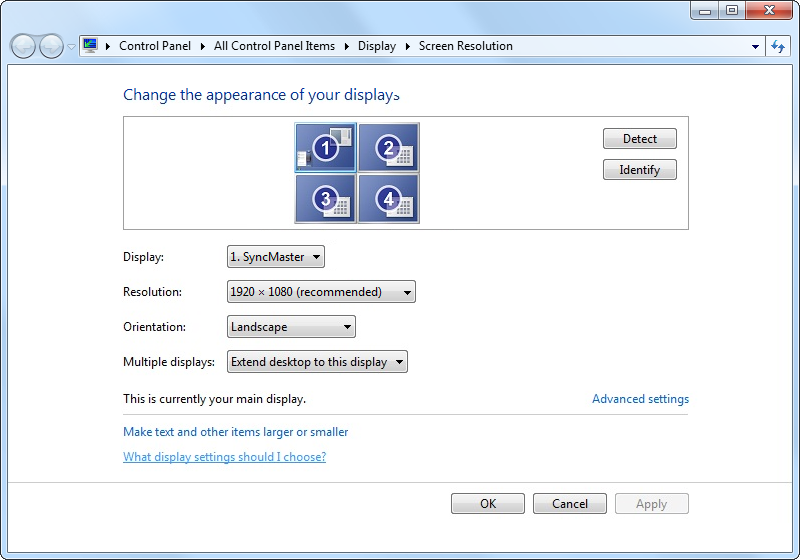 To open this dialog in Windows 7, right click the desktop and select the "Screen Resolution" entry. The monitor layout dialog in the screenshot below should now be visible. Windows assigns each monitor with an "X,Y" coordinates (X = Pixels from left, Y = Pixels from the top), where the primary (first) monitor is always "X:0, Y:0". Using the mouse cursor, drag secondary monitors to any position relative to the primary monitor. 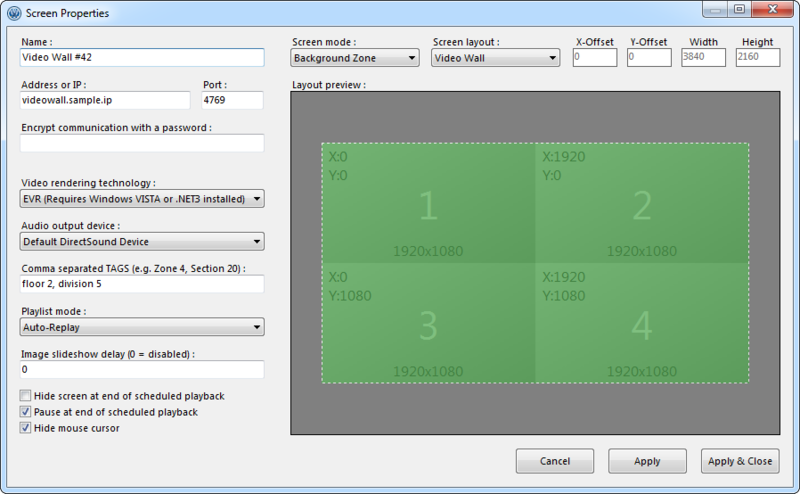 For example, in the sample layout screenshot, there are four Full-HD (1920x1080) display devices setup in a 2x2 layout. With a simple drag & drop operation using the mouse cursor, the layout can be changed to 1x4 or 4x1. Not all video rendering technologies support spanning a video window across multiple monitors. by default, Zoom Presenter uses the 'Enhanced Video Renderer 9' video rendering technology. As an option, MadVR has been determined to be a worthy alternative with support for high-end scaling algorithms (bicubic, lanczos, jinc), providing sharper and smoother images, especially when used in combination with a high-end display card. Select the active video rendering technology by editing the video wall's screen entry. With the display devices wired to the Windows PC and a copy of Zoom Presenter installed on the same Windows PC, the final step is configuring Zoom Commander to identify the presentation Windows PC and assign the video wall coordinates. Since each 'screen' entry in Zoom Commander controls one Zoom Presenter instance and a video wall setup requires only one instance to span the video across multiple screens, the first step is to add a screen and set the layout to 'Video Wall'. In cases where the video wall should be limited to a subset of the connected display devices, set the 'Custom Position' layout and specify the custom position values to match the desired layout. For example, in the screenshot below, a 2x2 layout of 1920x1080 display devices is configured. Since the primary screen always begins at coordinate "X:0, Y:0", the 'X-Offset' and 'Y-Offset' values are both set to "0". In a 2x2 layout, the width and height is the combination of the width and height of both display devices, a value of "Width:3840" (1920*2) and "Height:2160" (1080*2). In a 4x1 layout using 1920x1080 display devices, the 'X-Offset' and 'Y-Offset' values will remain at "0", with a "Width:7680" and "Height:1080". Please note that not all display cards support a 'Width x Height' video resolution greater than 4096x4096 on a single card. GO TO "Adding a new screen"